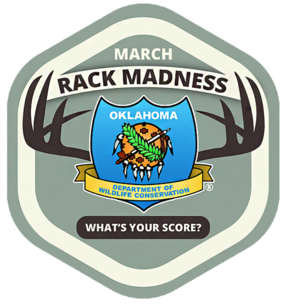 Wildlife Department March Rack Madness Promises a Crazy Good Time! Ever wonder how that deer, elk, pronghorn or black bear you bagged might stack up against the best of the state’s Cy Curtis Award winners? Well, you’ll get the opportunity to find out if you have your antlers, horns or skulls professionally scored during March Rack Madness! For the third year, this free public scoring event is returning bigger and better than ever at the Oklahoma Department of Wildlife Conservation’s headquarters. For the first time, drawings will be held for prizes to be awarded to those who bring items for scoring. The grand prize will be an Oklahoma Lifetime Combination Hunting and Fishing License valued at $775, provided by the Oklahoma Wildlife Conservation Foundation. March Rack Madness will run from 1 to 8 p.m. March 5 at 1801 N. Lincoln in Oklahoma City. Attendees will also find free informative seminars, food concessions, Operation Game Thief trailer, a free fish fry and great camaraderie among fellow sportsmen and sportswomen! Scoring will be handled on a first-come, first-served basis. There is a two-item limit per person. Each person who brings items for scoring will be registered for the event and will receive a free subscription to Outdoor Oklahoma, the official magazine of the Wildlife Department. Anyone bringing items will also receive one entry into the prize-drawing hopper. Prize drawings will be held each hour, with the grand prize drawing at 6 p.m. Winners must be present to claim prizes. Grand prize winner must be eligible to hold a lifetime license and will have an option to transfer the license to someone else who is eligible. While walk-ins are welcome, attendees are urged to pre-register, which could quicken the pace for scoring. Pre-registration is done through your Go Outdoors Oklahoma account: Go to https://license.gooutdoorsoklahoma.com/Event/Events.aspx, click on the “Register” link, and follow instructions. 1 p.m. – DIY Deer Rack Scoring: Learn how to score a rack yourself with just a few simple tools. Hear from experts on what it takes to measure a typical or nontypical trophy right down to an eighth of an inch. 3 p.m. – Deer Aging: You've heard that “Hunters in the Know … Let Young Bucks Grow!” But just how do you tell a young buck from an old buck? This seminar will help with tips and tricks for estimating the age of a deer on the hoof and show you how to interpret tooth wear to ensure you are a knowledgeable deer manager before, during and after every hunt. 5 p.m. – Field Trophy Care: Don't wait until you have a deer of a lifetime on the ground to learn how to take care of your trophy. This seminar will take you step by step through a demonstration of caping out a deer and will give you all the information you need to either do it yourself or make you the favorite customer of your taxidermist. This seminar will be led by Wade Free, Wildlife Department Assistant Director and accomplished taxidermist. Food trucks have been invited to set up beginning at noon. Those that have confirmed are Oh My Gogi (Italian), Coits and Phil Me Up Cheesesteaks. Don’t miss the “Wall of Shame” exhibit in the Operation Game Thief trailer. You’ll see various wildlife that was stolen from law-abiding sportsmen and sportswomen of the state. Game wardens will be on hand to chat with visitors. The Wildlife Department will prepare a fish fry starting at 5 p.m., free for all attendees. The grand prize drawing will be at 6 p.m. And there will be other activities as well. Of course, the centerpiece of the Madness is the scoring. A team of certified scorers will be working nonstop until 8 p.m. Those who arrive too late to have items scored will have an option to leave their items to be scored later. There is a two-item limit for each person bringing something to be scored and the service is free. To qualify, antlers must both be attached to the skull plate whether mounted or unmounted. In addition to white-tailed and mule deer antlers, scoring will also be available for elk antlers, antelope horns and bear skulls. Hunters whose items meet the minimum required scores will be eligible to enter the Department’s Cy Curtis Awards Program, which recognizes trophy Oklahoma mule deer, elk, antelope and black bear as well as the hunters who harvest them. The program began in 1972 and is named for a former Department wildlife biologist who is recognized as the person most responsible for the restoration of white-tailed deer populations in Oklahoma.